Samsung recently launched the Galaxy Tab 5e, a mid-range and lightweight tablet, and now it’s expanded its 2019 portfolio even further with Galaxy Tab A (2019), a redesigned Galaxy Tab A, which packs some new features over its predecessors. The new Galaxy Tab A comes with support for the S-Pen, a feature not seen in previous Galaxy Tab A models, showing the tablet could come more in line with the Galaxy Note smartphones and Galaxy Tab 4. Apple recently launched its newest batch of iPads, including the iPad Air (2019) and new iPad Mini, the latter of which is one of the most affordable iPads to date – so it’s the closest competitor to the new Galaxy Tab A (2019). The Samsung Galaxy Tab A (2019) doesn’t look like it’ll be the most powerful tablet in the world – it’s set to have 3GB RAM with the mid-range Exynos 7904 chipset, and will pack only 32GB internal storage, although that can be expanded up to 512GB with a microSD card. Inside the tablet is a 4,200mAh power pack, a big step down from the Galaxy Tab 4’s 7,300mAh, but that’s more of a premium Android tablet. Samsung says this will last for 11 hours of use, but we’ll need to get hands-on with the tablet to see if that’s the case. 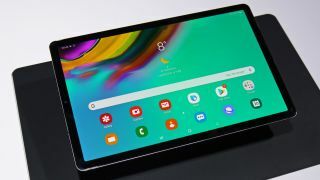 The tablet will pack an 8MP rear- and 5MP front-facing camera – that’s not particularly impressive compared to the recent Samsung Galaxy S10 range of smartphones, but cameras in tablets are much more about functionality in video calls than photography. The 8-inch display will have a 1920 x 1200 resolution, which again isn’t on par with Samsung’s ‘premium’ tablets, but it’ll be fine for most uses. Samsung hasn’t announced a release date or price for the Galaxy Tab A (2019) yet, but judging by the middling specs we expect to see it cost less than $400 (roughly £300, AU$ 560), which is the price of the better-specced Samsung Galaxy Tab 5e. When we find out the price and release date, and get our hands on the tablet, we’ll let you know, so stay tuned to TechRadar for all the latest tablet news.